^ a b c Hoffleit, D.; Warren, W. H., Jr. (1995-11). “Bright Star Catalogue, 5th Revised Ed.”. VizieR On-line Data Catalog: V/50. Bibcode: 1995yCat.5050....0H. http://vizier.u-strasbg.fr/viz-bin/VizieR-5?-ref=VIZ5a76628e9487&-out.add=.&-source=V/50/catalog&recno=6241. ^ Richard H. Allen (2013-2-28). 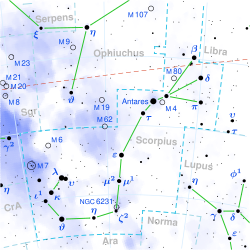 Star Names: Their Lore and Meaning. Courier Corporation. p. 383. ISBN 978-0-486-13766-7. https://books.google.com/books?id=vWDsybJzz7IC. ^ Patrick Moore (1983). The Guinness Book of Astronomy Facts & Feats. Guinness Superlatives. p. 242. ISBN 978-0-85112-258-8. https://books.google.com/books?id=skCsAAAAIAAJ.